The Macabre Observer: Highwaymen and Footpads in North Northamptonshire. 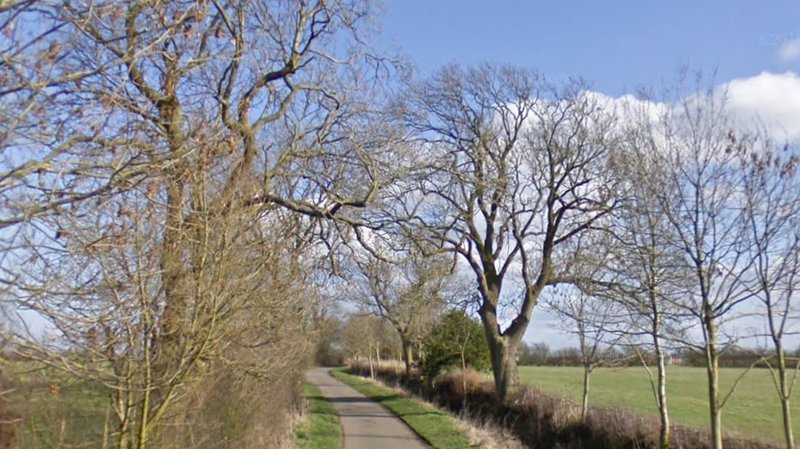 Highwaymen and Footpads in North Northamptonshire. I've recently been reading stories of swashbuckling, derring-do and highwaymen, fine stuff I'm sure you'll agree. Searching through some files of old newspaper cuttings, I came across a few articles I was saving for a reason that escapes me now. I used to live just north of Northampton in a village called Brixworth, this rather picturesque village is found along the A508, also known as the Harborough Road as it eventually reaches Market Harborough and then on to Leicester. Many years ago I searched the Northampton Mercury for stories of highway robbery along this road and close environs, it was a long drawn out process, all microfilm and photocopiers, sounds quite mediaeval by todays standards! I've re-read the stories and I believe they need to see the light of day, so dear friends I take you back to the afternoon of the 16th December, 1738, just near the Northampton gallows (now the White Elephant crossroads..ish). "Mr Bracekettle of Holcot and a farmer of Overstone Grounds, on their return home from our market, were attacked by a single highwayman near the gallows, who took from each of them five shillings, being all the money he could find about them. Immediately he rode up to another man, but his horse stumbling, the man had the good luck to escape his hand. On Thursday last a butcher of this town coming from Moulton, was stopped by a highwayman who presented a pistol to his breast and took from him about forty shillings." Leaping ahead quite some years, something must have happened, couldn't find it sadly, we now find ourselves in October 1780....it's a Friday night...about 10 o'clock. 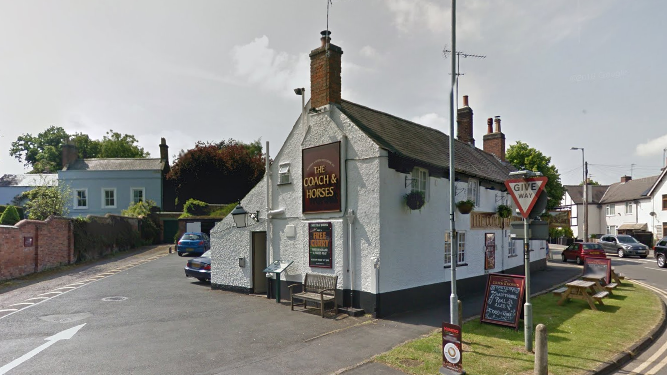 "Two post-chaises were stopped upon the Harborough Road, near Kibworth by two footpads. One of the Gentlemen in the first chaise declared he would not be robbed and discharged a pistol at them. Whether either of them was wounded or not is uncertain, but they thought it proper to desist from any further attempt." One dark night (about 8 o'clock) in December 1781 a traveller was heading down Sibbertoft Lane towards Clipston, it's a lonely spot even today but this encounter must have been terrifying! 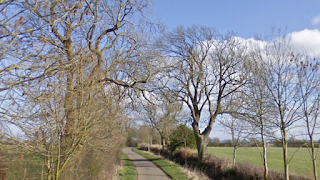 "John Allen of Oxendon, (on returning from North Kilworth where he had been to receive some money) was stopped in the lane between Sibbertoft and Clipston by two footpads. One of them held his horse and beat him on the arm, while the other, with horrid oaths, presented a pistol to his breast and robbed him of four guineas, threatening him with instant death if he didn't immediately deliver him the money. One was a tall fellow, dressed in a carter's frock and slouched hat, the other was a short man, dressed in a dark shabby coat and a slouched hat and had on a flesh coloured mask. Sibbertoft Lane, a lonely spot. 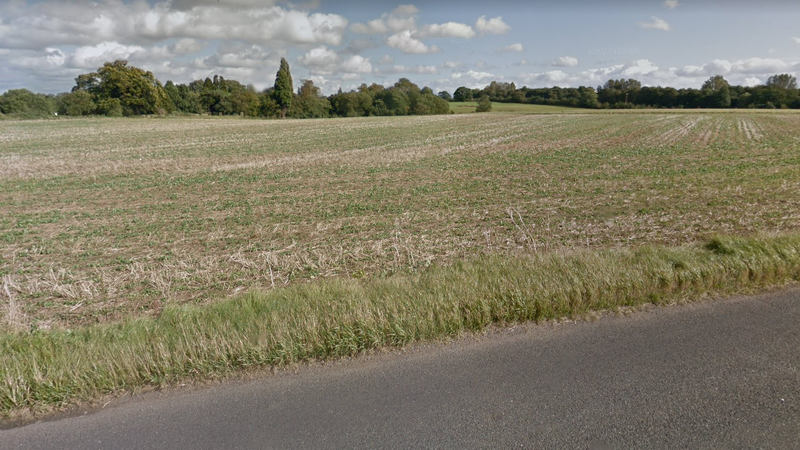 A farmer from Clipston that same night met the man with the mask on a path outside the lane, who dared not alone to attack the farmer but walked off to a distance of a few yards and whistles surprisingly shrill, to which another answered with a whittle. During which time the farmer ran so far they could not rob him." Near Brixworth is another charming village called Pitsford, I'm not sure when it changed it's name, but in the 18th century it was known as Pisford, I have to admit, that made me smile. So, we find ourselves on a Thursday night around 7 o'clock in October 1782. "Richard Thurland, a shepherd, on his return home from Scaldwell, in this county, to Kempstone, Woodend, Bedfordshire was stopped by two footpads between Pisford and Boughton, near the pond of the Earl of Strafford. One of whom held him by the shoulders whilst the other robbed him of a canvas purse containing seven shillings, being all he had. He begged them to return him a shilling to bear his charges, having a long way to go, which they refused." On a Saturday evening in February 1784 one chap had a lucky escape and another not quite so lucky. 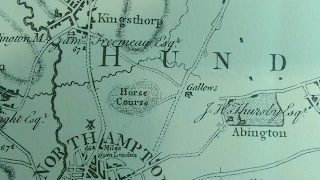 "Thomas Ward, baker of Brixworth, in this county, was returning from our market. He was stopped between Kingsthorpe and Boughton by a footpad who made him dismount. He demanded his money and threatened to blow his brains out if he refused. He then searched his pockets, but finding no money except a few halfpence he let him pass without any further molestation. The same evening Mr Jonathan Waples, butcher of Pisford was stopped near the same place and robbed of about fourteen shillings in silver. The robber was a tall man, dressed in a blue great coat and boots." Fairs were pretty dangerous sometimes, Boughton Fair was no exception. Boughton Green looking towards the ruins of St John's church. "Mr Clark, hatter of this town was returning with his wife in a one horse chaise from Boughton Fair. He was stopped near Boughton by two footpads who robbed him of a few shillings, but not content with their booty one of them attempted to get into the chaise to search Mr Clark, upon which he jumped out on the other side and made the best of his way to Boughton. They then demanded Mrs Clark's money, which she was proceeding to deliver, but luckily a person coming in sight, they decamped in great haste. The same night a man who had been selling cutlery goods at the fair was stopped by the same fellows. 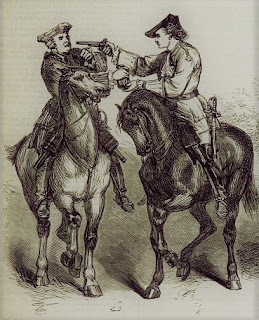 But making some resistance one of them struck him several times on the head and face with his pistol, after which they robbed him of about six guineas and got clear." I bet Mr Clark was in trouble again that night! Scotland Wood , sadly quite depleted. "A post chaise, in which were three Gentlemen was stopped near Scotland Wood, between Maidwell and Kelmarsh by two footpads. But the Gentlemen who were each armed with a pistol declared they would not be robbed and threatened to fire upon them if they persisted in their attempt. They thought it proper to make off." "Mr John Munden of Brixworth was returning home from this town, he was fired at from a gate near a place called Coal Tracks, between Kingsthorpe and Boughton by a fellow on horseback. A ball passed through the breast of his coat, providentially without doing him any damage, though his coat was buttoned across the breast and the ball entered between the button holes. Mr Munden's horse started at the report and flash of the pistol and was very near throwing his rider, but luckily he recovered his seat, rode off at full speed and escaped being robbed." Sometimes the baddies were caught and they could expect little mercy, just a couple of months after John Munden's lucky escape highwayman John Roberts luck ran out. 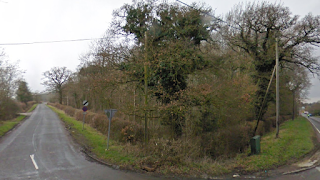 "7th March 1785: On Saturday last John Roberts was executed in Boughton Lane, about 3 miles from this town, near the spot where he robbed the mail. He confessed the crime for which he suffered and acknowledged the justice of his sentence. At the place of execution he admonished the numerous spectators to take warning by his untimely fate and particularly desired them not to reflect on his brother, who was charged with being his accomplice, declaring that he was entirely innocent. After hanging for the usual time his body was cut down and put into a coffin in order to be interred." Nothing like a good hanging on a Saturday afternoon! On the 12th October 1799 another robber was caught at Boughton, sadly I don't know his fate. "On Wednesday was committed to the gaol of this county by the Rev Edward Bayley one William Wright of Kingsthorpe, labourer. 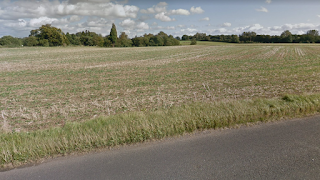 Charged on the oath of Richard Warner, of Boughton, with having in company with three other persons not yet taken, violently assaulted the said Richard Warner in the evening of the 21st of September last on the highway in the parish of Boughton aforesaid. And with felonously stealing from the said Richard Warner two wooden bottles containing 13 quarts of ale, of the value of eleven pence, the property of Thomas Faulkener, of Boughton, husbandsman." "Philip Boswell, brick maker of Daventry was travelling from Husbands Bosworth, in Leicestershire, to Kelmarsh, in this county. He was attacked about eleven o'clock at night between Sibbertoft and Clipston, by two men who demanded his watch and money. But upon Boswell saying he had none they threw him on the ground and searched his pockets, but finding neither money nor watch they untied his garters. With one of which they tied his legs and with the other his left arm to his left thigh. After which they threw him into the brook, where he would have sufficated if his right arm had not been at liberty. With which and the assistance of his teeth, after remaining in the water for ten minutes, he found means to untie the garters and extricate himself. The two men were dressed in smock-frocks with sticks in their hands, one man was six feet high, the other about five feet eight inches. Another man about five feet eight inches high was also with them, dressed in a dark great coat, but he did not give any assistance to the others in their assault upon Mr Boswell, but kept at a distance." 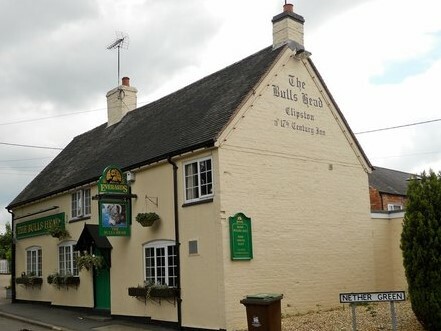 "William Jones, otherwise Johns and John Taylor, charged on a violent suspicion of having on Tuesday evening the 21st of October last, on the King's highway, in the parish of Maidwell assaulted and beat John Richardson of Brixworth, inn holder. Robbed him of a red morrocan pocket book, containing two five guinea Harborough banknotes, a ten pound Harborough banknote, a five pound Stoney Stratford banknote, a one pound Bank of England note and between nine and ten pounds in gold." They were both found guilty and hanged at Northampton on the 7th March 1801. 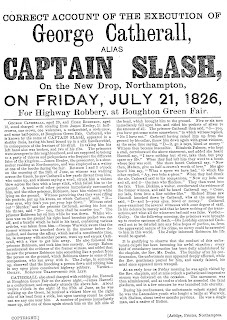 It would be remiss of me not to mention the most famous highwayman of North Northamptonshire, George Catherall was an ex-soldier and boxer from Bolton in Lancashire, a tall athletic villain with a mashed up back due to many military floggings. 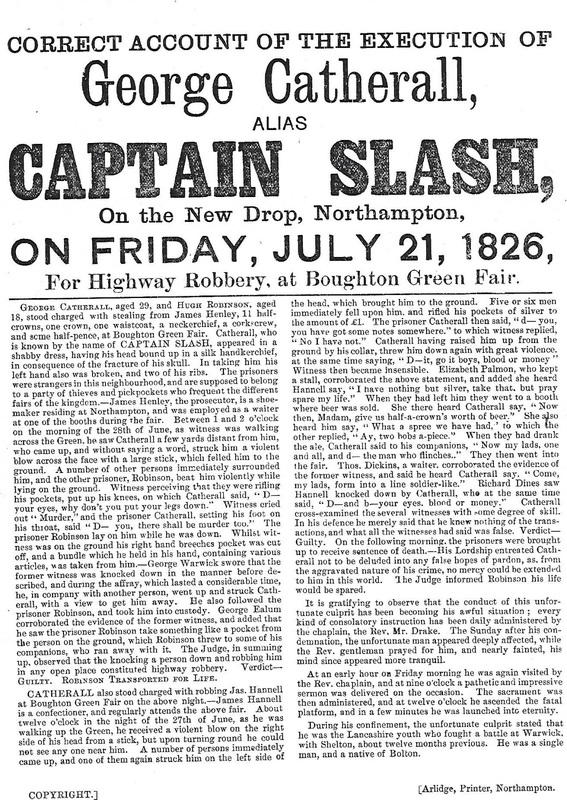 He and a small band of trouble makers had been in town for a while committing several robberies, he soon got a name for himself, this name was Captain Slash. The crimes that were his downfall were committed as the Boughton Fair was closing, Catherall and a gang member called Hugh Robinson robbed a James Henley of eleven half crowns, one crown, one waistcoat, a neckerchief, a corkscrew and some half pence and Catherall alone robbed a James Hannell of one pound in silver. Arrested and tried for assault and robbery at Northampton, the two were found guilty and sentenced to death, later Robinson's sentence was commuted to life. The execution was performed in front of a huge crowd on the 21st July 1826, before the fatal moment Catherall kicked his boots into the crowd, allegedly in defiance of his mother who said he would die with his boots on. He convulsed for about two minutes before life was deemed extinct, afterwards several females approached the corpse to rub their wens and warts on his hand as heeling folklore directed, he was buried on the north side of St. Giles church yard the same day. 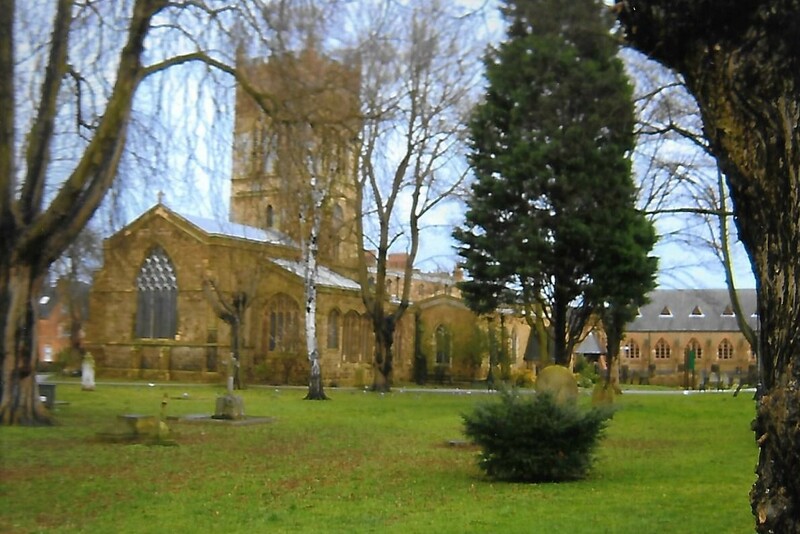 The North side of St. Giles church, Northampton. In more modern times the supernatural aspect of long dead felons has become ingrained in the folkloric narrative, Captain Slash Catherall is no exception. His ghost is said to haunt St. John's ruins, personally, I've been there many times both day and night and I've seen nothing unfortunately, but who knows...give it a try! 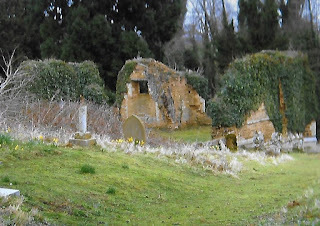 The ruins of St. John's church, Boughton.